There are currently 91,474 users on this website. Here ya go. From 1861 to 2009. It's been a while since I was last on here. Picked up several notes, obsoletes and other misc. finds. I'm a huge fan of the pre-commonwealth Philippines notes. Check out the back, nice colors and it's nearly a crisp unc. example. Here's a unique North Africa short snorter, signed by some airmen stationed in Cairo, Egypt. Found this Barr note in a strap a couple weeks ago, I like the unique serial combo of a ladder/in a row. And here is a Series 541 MPC, it's a replacement note that I paid non-replacement money for. Picked up another nice national, a tough state to find even though it's the capital. And here's a pleasant surprise from the bargain foreign box, nice serial! Recent arrivals. I live in Charlotte (since 1983), so these had a personal significance for me. 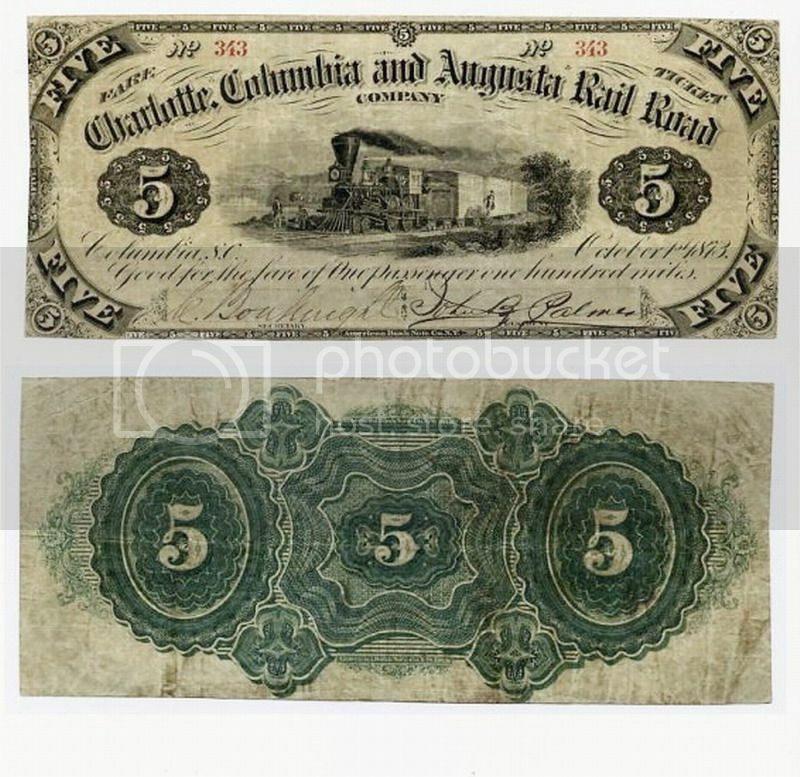 The Charlotte Columbia and Augusta Railroad printed fare tickets that resembled currency in $1, $2, $5 and $10 denominations with vignette of a steam locomotives on the front. The $1 fare ticket was good for one person for 20 miles, $2 fare was good for two people 20 miles. The $5 fare was good for one person 100 miles, with the $10 fare was good for two people to go 100 miles. 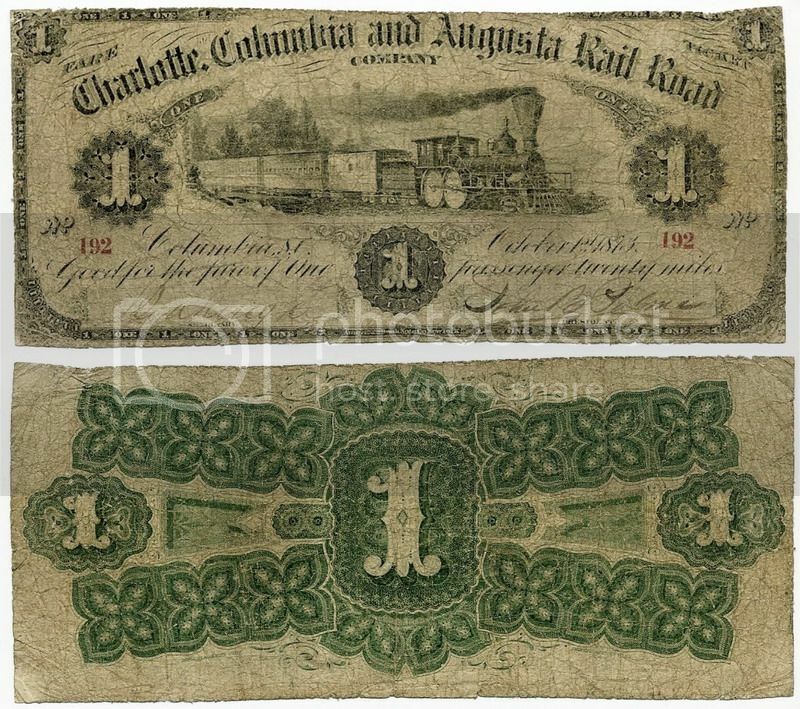 Printed by the same American Bank Note Co. that printed currencies, these were called Fare Tickets to circumvent Federal laws that prohibited railroads and others from issuing currency. 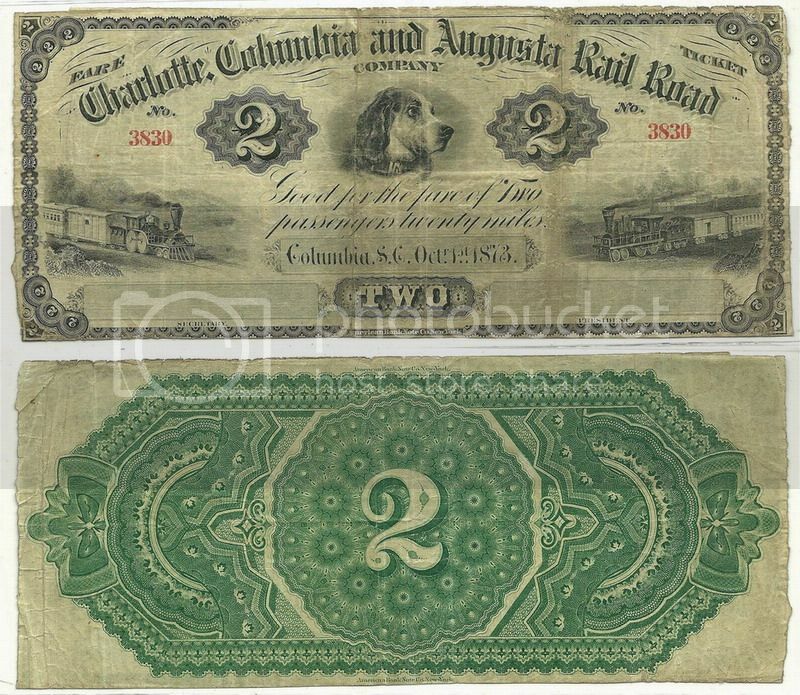 However, many businesses along the railroad would accept these fare notes as currency for goods. The line operated about 191 miles of track between Charlotte, North Carolina, through Columbia, SC and ending in Augusta, Georgia. It existed between 1869 and 1894 when it became part of the Southern system. All of the notes have an October, 1873 issue date. Nice tickets Mack, I saw those in the other forums and I must say they are beautiful. 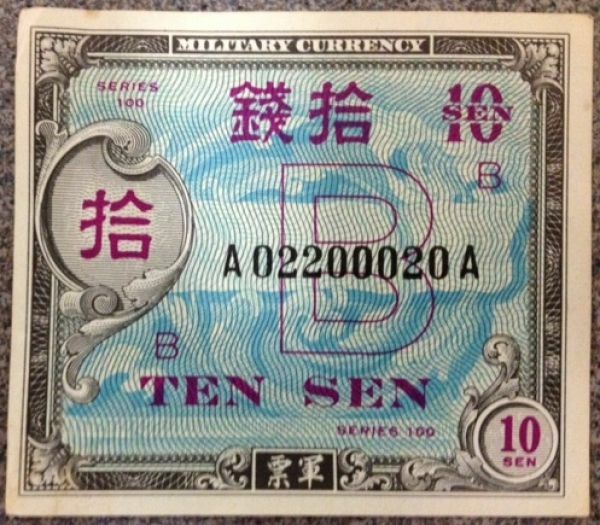 Are there higher denominations past the $10? Thanks kookoox. 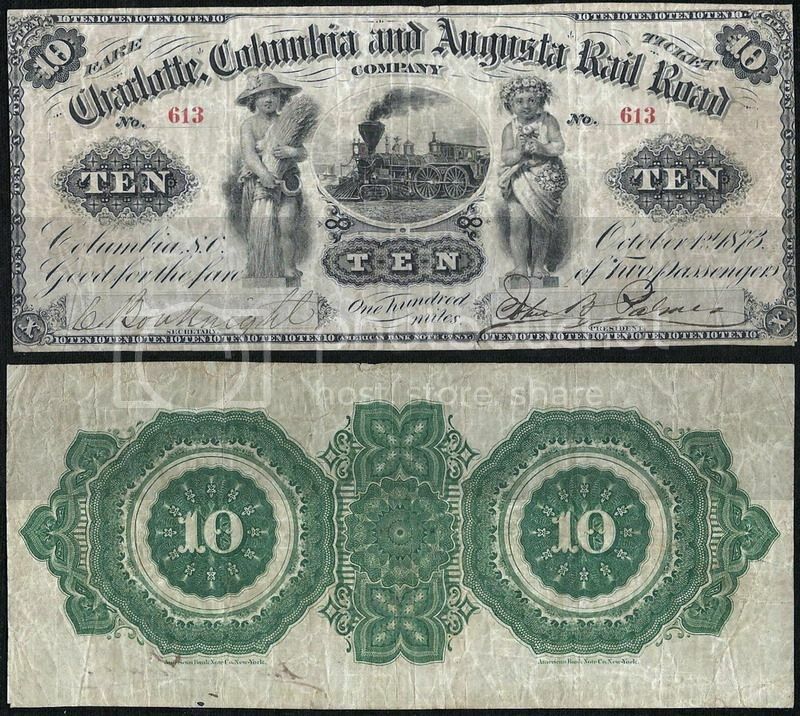 The 1, 2, 5 and 10 were the only denominations for this railroad. The 10 is the highest. Those are really nice notes. I love the vignettes of the 4-4-0 steam engines. They were the workhorse engines of the south. That is neat seeing something related to the history of the South. Thanks folks. I've lived in Charlotte for 29 years, so the notes were a bit of local history that I never knew about. When I saw the $10 and got it, I knew had to have the rest of the series. Plus I really liked the vignettes of the locomotives, and the other subjects. I thought the dog vignette on the $2 was pretty cool too! 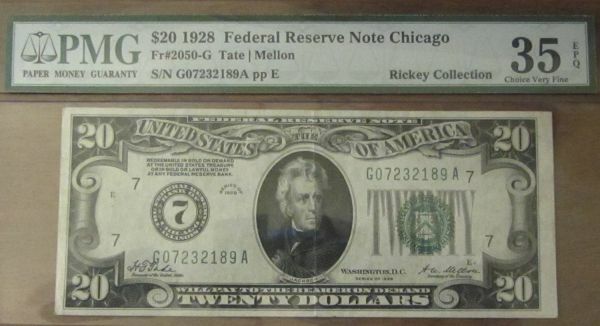 Plus, it was nice to see obsolete notes with a nice ornate reverse too - many obsoletes are blank on the back. 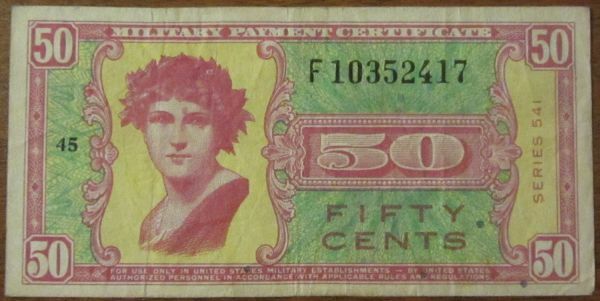 I don't have that many, but the obsolete notes can really be quite attractive. Nice engraving and vignettes on many of them. That's a superb looking MPC. The great news is that most of the higher graded MPCs are among some of the most affordable. At the F.U.N. Coin Show, picked up a $5 US North Africa to complete the set, and a $100 CSA.